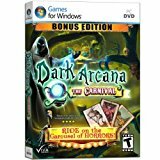 Dark Arcana: The Carnival - Bo..
RIDE ON THE CAROUSEL OF HORRORS! As a detective, you're called to a rundown carnival to search for a woman that has gone missing. You'll quickly discover this is much more than a routine missing person case. A sinister force has taken up residence in the carnival's Hall of Mirrors; transforming it into the portal to an alternate version of reality in a dark, surreal world where an evil presence is longing to escape. Investigate two worlds: the one you know and an alternate plane existing behind the Hall of Mirrors. Uncover the secret of an ancient being known as the Evil One and stop it from invading our world. Experience a thrilling spectacle that wraps challenging hidden-object scenes and chilling adventure with a gripping storyline that keeps you moving forward with every twist and turn in this Special Bonus Edition that includes extended gameplay and more! RIDE ON THE CAROUSEL OF HORRORS! As a detective, you're called to a rundown carnival to search for a woman that has gone missing. You'll quickly discover this is much more than a routine missing person case. A sinister force has taken up residence in the carnival's Hall of Mirrors; transforming it into the portal to an alternate version of reality in a dark, surreal world where an evil presence is longing to escape. Investigate two worlds: the one you know and an alternate plane existing behind the Hall of Mirrors. Uncover the secret of an ancient being known as the Evil One. Reveal the story of star-crossed lovers and stop the Evil One from breaking its magical chains and invading our world. Experience a thrilling spectacle that wraps challenging hidden-object scenes and chilling adventure with a gripping storyline that keeps you moving forward with every twist and turn in this Special Bonus Edition of DARK ARCANA: THE CARNIVAL that includes extended gameplay and more! This hidden object game kept me at the computer a little more than I wanted to be each time. It is great. The price was good and it really kept me on my toes. It will not work on windows XP or an older computer but I doubt if anyone has anything older than an XP (I loaned it to my friend who has one but it wouldn't work) The sounds are great and I would not reccommend a young child seeing some of the scenes (no blood or gore) just mons..